Hi everyone and happy Saturday! Anna-Karin from the DT here with this week's I Spy Saturday post. As always, I had lots of fun looking at all the creative ways in which people use Sizzix dies and embossing folders. I've picked three different projects to showcase today. I had a hard time picking just one project to feature from Sandra Mouwen's blog. 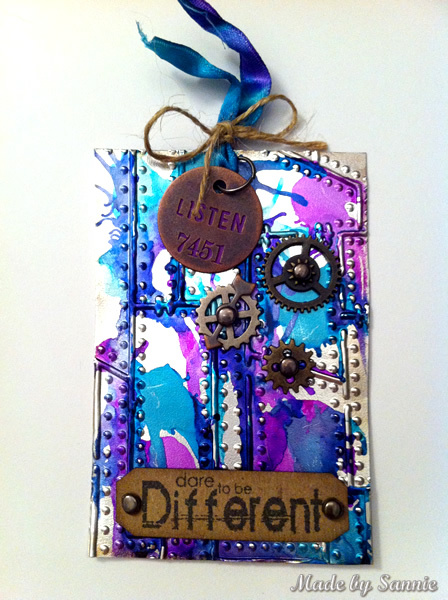 Finally, I settled for this vibrant Dare to be different tag using the Riveted Metal texture fade, aluminium tape and alcohol inks. Such a great effect! Don't miss checking out Sandra's blog which is full of fun projects, using bright colours and inspiring techniques. I spied the next project linked to an earlier I Spy Saturday post. It's a sweet mini-album made by Pam Bray using Eileen Hull's Scoreboards Photo Album die. Look at that great cover with the patterned papers, fibers and charms, and each inside page is different, with lots of interactive elements. Visit Pam's blog to see the inside of the album and many other wonderful projects. 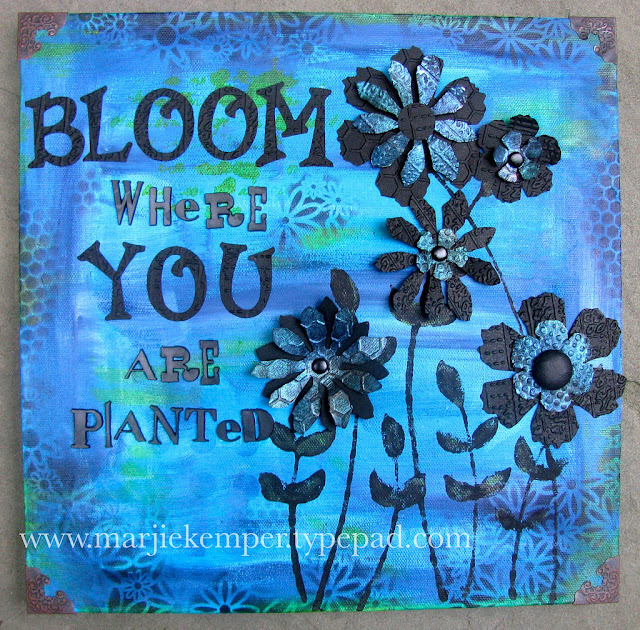 The last project was spotted in the Sizzix Flickr gallery, a stunning canvas by Marjie Kemper. I just love the look of the Tattered Florals, layered and embossed flowers. Very cool! She also used a favorite sentiment of mine and such a great idea to emboss some of the title letters. Marjie shares a tutorial for how she made the flowers here, and her blog is full of gorgeous projects making me want to sit down and craft this very minute. I hope you enjoyed these projects as much as I did! Have a fabulous weekend! PS- We have a winner to announce from our new products post last week! Kellystar had the random willing comment for the fun prize pack of Bohemia Texture Fades! Congratulations to Kelly and many thanks to all who joined in the fun and left comments for us. There are more fun give aways coming up so keep checking our blog and commenting! Thanks so much for featuring my project, Anna-Karin. It's an honor to be in such fine company! All the projects are so beautiful! Such inspiring ideas and Beautiful creations! Time to get cranking! Thank you for featuring my album. I am so honored.